JUNE 2013. Please visit our new photos of Jura spring wildflowers. 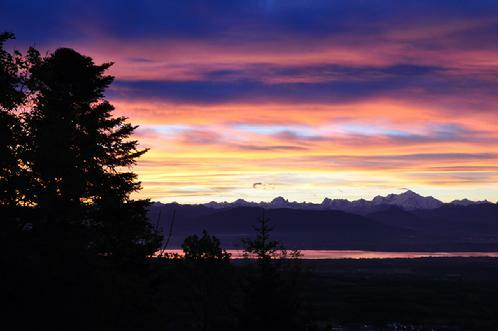 The photos on these pages show views of and from the beautiful Jura mountains. The Jura run along the western edge of Switzerland and part of the eastern edge of France. At their north-eastern end they reach into the southwest corner of Germany. On a map the Jura arc like a parasol over two of Europe’s largest lakes, Lac Leman and Lac Neufchatel. Thanks to photographer Anthony Ibarra for the banner photo, above, of the Alps and clouds in the winter moonlight. We welcome your Jura photos, too. We will feature the best on this page and, of course, give credit to the photographer. For info on outdoor activities in the Jura, visit the Monts Jura Web site. Is photography art? Do we look at a photo because it is art? Or is it art because we look at it? And what if the photo is taken, not because the scene catches the photographer's eye, but because an arbitrary rule dictates where and when the photo is taken? In late March 2005 I drove from near Santa Fe, NM, to Bethesda, MD. Every 10 miles I took a photo out the opened right side window of the car. Whatever was there at that time appears in the photo—arbitrarily selected slices of the American highway-side across 10 states and four days. Please join me now on a 1900-mile journey captured in photos taken every 10 miles. You can see the photos at http://www.every10miles.com. (And please turn on your speakers.) Note: The photo viewer will not run in a 64-bit browser. You've seen the movie? Now read the book! E-mail eds@jura-eds.com for more information. Accident or art? Accident and art? Here's a new gallery of photos taken when or as the camera--and not the photographer--decided. If you put a frame around it, is it art? Visit our new photo gallery, Lucky Flukes, at http://every10miles.jalbum.net.